Stories like this should heighten concerns about terrorists from Hezbollah and other groups taking advantage of America's porous border with Mexico. 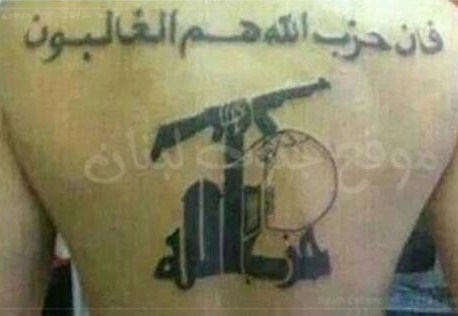 U.S. law enforcers have noted an increase of tattoos on prison inmates, particularly in the Southwest, with script written in Farsi and with graphics depicting Hezbollah imagery, the Wall Street Journal reported, citing a newly published book, Hezbollah: The Global Footprint of Lebanon's Army of God, by terrorism expert Matthew Levitt. The WSJ said Hezbollah's "operatives and sleeper cells are certainly in America. 'Law enforcement officials across the Southwest,' Mr. Levitt writes, 'are reporting a rise in imprisoned gang members with Farsi tattoos,' including some with Hezbollah imagery. Another official he quotes puts it this way: 'You could almost pick your city and you would probably have a [Hezbollah] presence.'"